Product prices and availability are accurate as of 2019-04-17 04:27:04 EDT and are subject to change. Any price and availability information displayed on http://www.amazon.com/ at the time of purchase will apply to the purchase of this product. Three best-selling slots titles are a now available for one lowprice! Get triple the authentic casino action in the IGT Slots 3 Pack: Cleopatra II, Paradise Garden and 100 Pandas! 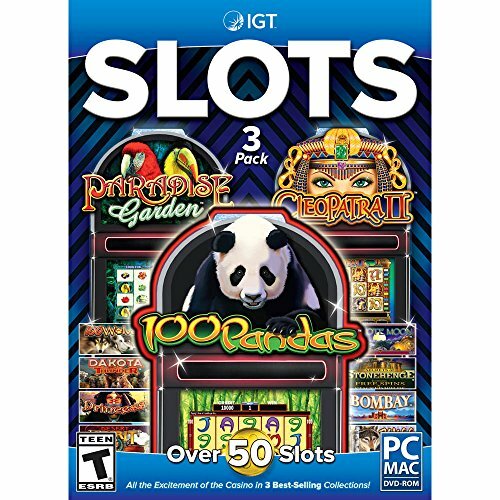 Three complete IGT Slots collections for the price of one: Cleopatra II, Paradise Garden and 100 Pandas. Single-line or multi-line wagers: Play up to 100 lines. Free Games with End to End Action, Super Scatter Pays, and Multiway Xtraadds 1,024 ways to win.